An Armenian traditional instrument master meets a master of jazz drumming for an unforgettable evening of unique and spontaneous music! Yoron Israel’s illustrious career includes 13 recordings as a leader and over 200 recordings as an accompanist. His latest project, New Dreams is slated for release early in 2019; other recent works include This Moment and Visions. Yoron has toured and recorded with such acclaimed artists as Sonny Rollins, Ahmad Jamal, Horace Silver, Art Farmer, Abbey Lincoln, David Newman, Kenny Burrell, Larry Coryell and Joe Lovano. Currently Assistant Chair and Professor of Percussion at Berklee College of Music. Mr. Israel is a world-class educator and clinician, his educational DVD, Creative Improvisation for the Drum Set, continues to inspire countless drummers and percussionists. 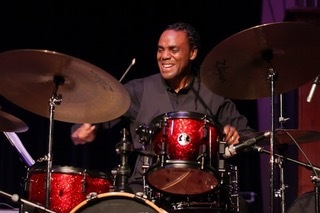 He is also the author of the popular Berklee Online course, Drumset Fundamentals. Martin Haroutunian a highly regarded musician and a student of Armenian folk music. 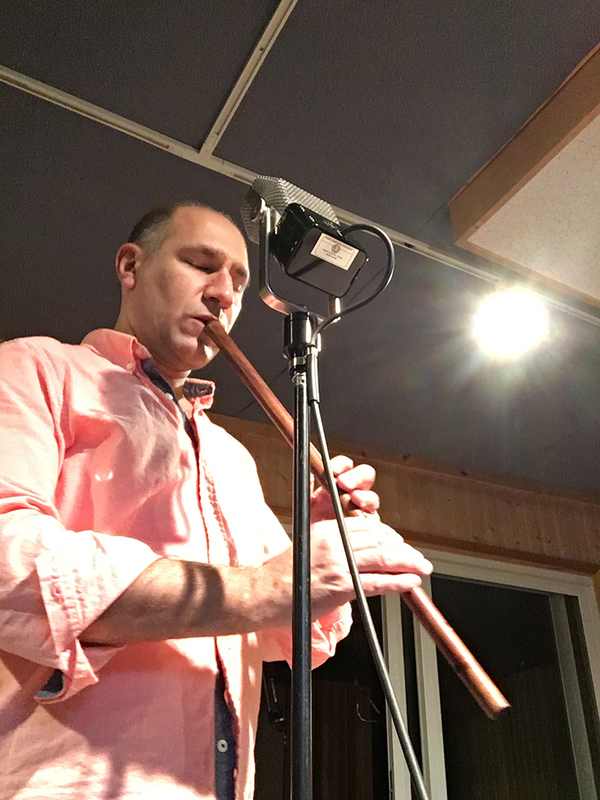 He performs and teaches traditional Armenian wind and percussion instruments, including dap, dhol (kopal), duduk, parkapzuk, pku, saz, shvi, sring (blul), and zurna. Martin has studied at the Komitas State Conservatory of Yerevan, Folk Instruments Department under Khachatur Avetisian in the Wind Instruments Division under Jivan Gasparian and the University of Massachusetts, Boston. He has also received private instruction from Professors Ohannes Salibian, Georgi Minasov, Ararat Petrosian, Gevorg Dabaghian and Norayr Kartashian. His critiques and reviews have been published in the Armenian Forum, Armenian Mirror-Spectator and Armenian Weekly. Martin has performed in Armenia, Australia, Canada, Cyprus, Holland, Italy, Lebanon, Switzerland, Syria, and Turkey. He was a guest artist with the Navasart Armenian Folk Ensemble of Paris, France during their United States tour with performances in Boston, New York, Fresno, San Francisco and Los Angeles. Martin has also toured with the Erebouni and Garni Armenian Folk Ensembles as principal soloist performing at various prestigious international festivals including the Festival of Nations in Albany, New York and the Wolf Trap International Children’s Festival in Vienna, Virginia. He has also has toured with Kurdish folk singer Şivan Perwer. Martin arranged and performed the music for New Repertory Theater’s 1998 production of Richard Kalinoski’s “Beast on The Moon” as well as acted as a consultant and recorded for the play’s 2005 Off-Broadway production. In 1989 Martin founded and has since directed the Arev Armenian Folk Ensemble performing extensively in the United States and Canada, including performances with the 2002 Christmas Revels. The ensemble’s first recording in 2003 received two nominations at the Armenian Music Awards. Martin is featured on various recordings including “An Anthology of Armenian Patriotic Songs”, “Portable Planet”, “Lullabies From The Cradle Of Civilization” and various film and television soundtracks, including the “Everything is Illuminated” original motion picture soundtrack. In 2007 Martin was invited to be recorded by Academy Award winning composer Gustavo Santaolalla for the film soundtrack of "Things We Lost In The Fire". He is also featured on recordings of Berklee Studio Production Projects, Raffi Adourian, Janette Khalarian, The Vardan Ovsepian Chamber Ensemble as well as The Komitas Project and Musaner (both directed by Ara Sarkissian). In 2006 Martin founded the Lusin Armenian Experimental Improvisation Group. He developed and taught a music appreciation program at St. Stephen’s Armenian Elementary School. Martin has been invited to play with the Chicago Symphony Orchestra, the Boston Pops Orchestra as well as with legendary folk singer Hasmik Harutyunyan and the Cornell Middle Eastern and Mediterranean Music Ensemble. He was invited by Carnegie Hall's Weil Music Institute to perform as part of its Musical Explorers program with Ara Dinkjian and Zulal a cappella trio. Most recently, Martin was invited to play at the premier of the new opera "Role Playing Game" by Jacob Shulman. Martin has also served on the Eastern Regional Executive Committee of the Hamazkayin Armenian Educational and Cultural Society.